slogan and hence my business name. My name is Dave Jenkins. I was born in Lancaster, Pa. A job opportunity for my father moved my family to Detroit, Mi when I was 8 years old. Quite a culture shock, from Amish country to inner city Detroit ! The woodworking bug first bit me long before Mr. Hanson’s wood shop class in 7th grade. He let me use the lathe for the first time. This basic woodworking class, in addition to my middle school art class introduced me to the art world and allowed me to sample a few mediums. Alas, during school, life happened. A long hiatus from art where I spent many years trying out different job opportunities such as rigging, machinist, roadie, crane operator, and engineering degree, and copier technician In Detroit about 1995, while restoring a 1967 Cutlass, all of my mechanics tools were stolen. Restocking a garage full of tools was not something I really wanted to do, so I decided to get back into woodworking. I bought a $169.00 lathe and started wood turning. My turning skills and the enjoyment I remembered began coming back to me and I haven’t looked back. Since my art teacher in 7th grade told me “that just doesn’t look right”, I have been self taught in my art endeavors. 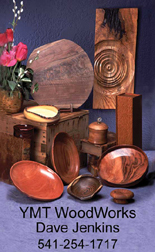 In addition to wood turning I also carve, draw, airbrush, photograph and do photograph manipulation, photograph restoration, graphic and website design, and business cards. I am most happy when my neurons have 40 or so projects to work on at the same time. Craving a slower pace and a love of travel, I left Detroit for New Mexico and I am now in Brookings, Oregon. Using I00 year old wood working tools handed down from previous generations, and much bigger and more expensive tools than my original $169.00 lathe, I am now settled in my 1500 square foot shop and doing what l love. I see something beautiful-I hope you do too. Here is a link to the Google Map for my gallery.